This textbook presents the physical principles pertinent to the mathematical modeling of soft materials used in engineering practice, including both man-made materials and biological tissues. It is intended for seniors and masters-level graduate students in engineering, physics or applied mathematics. It will also be a valuable resource for researchers working in mechanics, biomechanics and other fields where the mechanical response of soft solids is relevant. 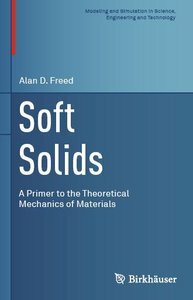 Soft Solids: A Primer to the Theoretical Mechanics of Materials is divided into two parts. Part I introduces the basic concepts needed to give both Eulerian and Lagrangian descriptions of the mechanical response of soft solids. Part II presents two distinct theories of elasticity and their associated theories of viscoelasticity. Seven boundary-value problems are studied over the course of the book, each pertaining to an experiment used to characterize materials. These problems are discussed at the end of each chapter, giving students the opportunity to apply what they learned in the current chapter and to build upon the material in prior chapters.